What a range at Donington Nurseries! We have seeds, packs of vegetable plants, fruit bushes, fruit trees, and herb plants. Heavy stocking is during main season March to July for vegetable and herb plants and Nov- May for Fruit trees and fruit bushes. Outside of these periods stock range may be limited. A good range of flower seed including wild flowers, is available alongside vegetable seeds. 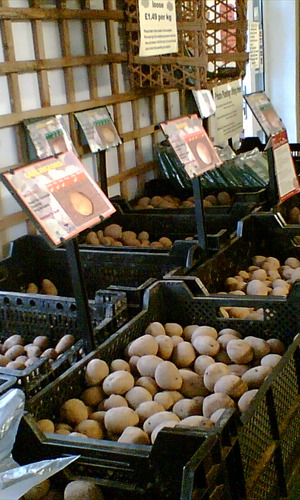 We also stock seed potatoes, garlic bulbs, shallot and onion sets. Seed trays, propagators, pots, thermometers, labels, tools, compost, vermiculite and perlite. Greenhouses, Coldframes and cloches. Frost protection fleece in rolls, covers and by the metre. Polythene sheeting both clear and black. Cloches and Netting. Plus a wide range of fungicides and insecticides. Climbing Plant supports, Herbaceous and Vegetable supports are all supplied by Donington Nurseries. Examples include trellis, obelisks, arches, bamboo canes, pea sticks, hardwood and softwood stakes, metal net stakes, netting, hoops, link stakes and many more! Our sundry department has a good range of ties and string to suit all requirements. Various brands are stocked and the range includes most general gardening tools; spades, forks, rakes, shears, loppers, secateurs, trowels etc. In addition we have a good range of watering equipment; watering cans, roses, hoses, hose fittings, sprinklers, and sprayers. Strimmer wire is also stocked in a range of thicknesses. A large selection of fertilisers from specific straights such as Bonmeal, Potash, Blood,Fish & Bone, Sulphates of Iron and Ammonia, Epsom Salts, Growmore and Lime in addition to liquid feeds, general purpose, tomato and vegetable, house plant, Ericaceous, Chicken and Farmyard Manure and Organic. Pesticides and fungicides suitable for indoor and outdoor plants as well as fruit and vegetables. Again we have a range suitable for the organic gardener. Weedkillers for lawns and gardens as well as weed control fabrics.